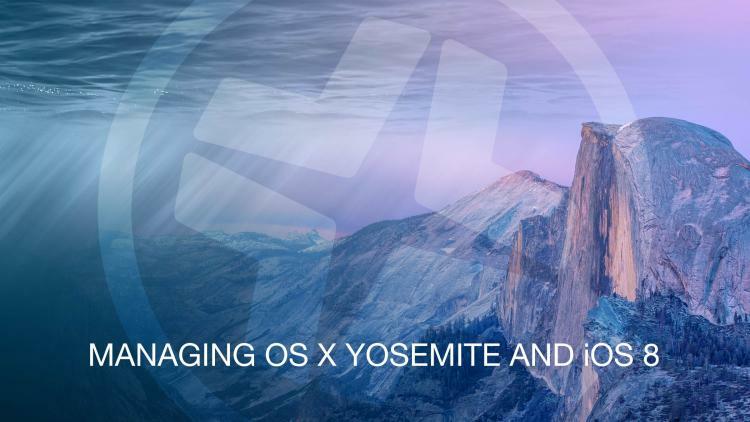 With OS X Yosemite and iOS 8, Apple has created the most cohesive and connected ecosystem of technologies to date. New features, such as handoff, shared calling and messaging functions, and enhancements to iCloud and AirDrop, provide seamless continuity for users across iOS and OS X platforms. Implementing both of these technologies will drive innovation, productivity, and learning more than ever before. But as more information is shared within this rich ecosystem, IT teams must seriously consider the management implications. With seamless integration comes inherent risk. What happens when information is passed from a managed device to an unmanaged device? Luckily, Apple has already thought about this by providing native management and security controls, as well as enhanced MDM capabilities. With version 9.6 of the Casper Suite, JAMF Software helps IT organizations embrace and extend new Apple technology without any risk — from day one of new releases. The Casper Suite leverages native Apple tools to provide best-in-class inventory, deployment, and security capabilities. This ensures an easy migration path to iOS 8 and OS X Yosemite, and ongoing management of the platforms within the Apple ecosystem. Once Apple technology assets are deployed, managed, and secured by the Casper Suite, extending new iOS 8 and OS X Yosemite features into an environment can be as seamless as the concept of continuity itself. IT can use the Casper Suite to simply enable or disable new features and report on the status of their use — extending the technology only to the appropriate users and devices. The Casper Suite was built to enhance the entire Apple ecosystem so that organizations can succeed with Apple. Learn more about how we can help your school or business put the Apple platform to work.